For over 65,000 years, Aboriginal and Torres Strait Islander women have diligently passed down their precious dreaming stories, songlines, language, ceremonial rituals and knowledge from generation to generation. This careful preservation of their culture has enabled it to remain vibrant, dynamic and strong in current day and infuses Australian culture with sacred history, spirituality and mysticism as well as Indigenous communities’ profound understanding of interconnectedness with sea and land. Admiring of the kinship found amongst Indigenous people and sharing a similar respect for tradition, inspired the Swan Districts Football Club to create a project that would reflect the vibrancy and richness of the Aboriginal and Torres Strait Island cultures whilst serving to bring the Swan community together. The club launched a competition that tasked entrants to design a billboard that highlighted the importance of Aboriginal and Torres Strait Islander women’s contribution to our country and promoted 2018 NAIDOC theme ‘Because of Her, We Can’. Five schools - Midvale primary school, St Michael’s Primary, Swan View Primary, Moorditj Noongar Community College and Swan View Clontarf Academy - were invited to participate in the competition. Each was asked to select one winning design from their students’ creations to submit for judging by a panel chaired by Kylie Graham, designer of the Swans’ WAWFL Women’s NAIDOC playing jumpers. All the finalists and their classmates have been invited to attend the Swan’s NAIDOC home game and will receive free entry and a free Mrs Mac’s sausage roll and soft drink. The overall competition winner and classmates will also each receive a specially designed Swans NAIDOC mini footy and a class photo will be taken and published on the club’s website and social media pages. 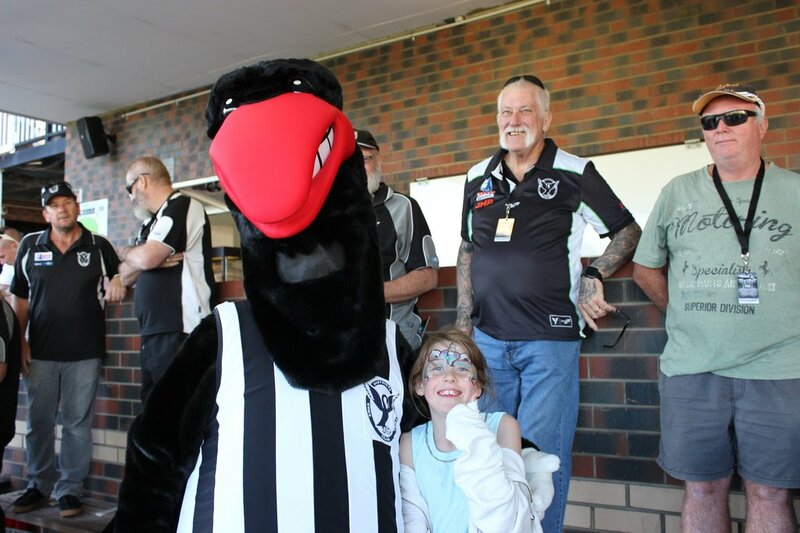 Additionally, teachers from each school will each receive two tickets to attend Swan Districts’ pre-game Legends Luncheon with their chosen guest. The luncheon will feature an esteemed panel of female speakers who will be discussing this year’s NAIDOC theme ‘Because of Her, We Can’. Our guest speakers have been thoughtfully selected in line the theme, which celebrates the diverse, significant, active and essential roles Aboriginal and Torres Strait Islander women have played, and continue to play, in society. As pioneers, ambassadors, leaders, artists, sporting icons, activists, academics, celebrities, entrepreneurs, innovators, musicians and professionals across all industries and sectors, Indigenous women have long inspired and influenced the global community and continually add to their legacy as agents of change. We cannot think of three women who better embody this than: Winner of the 2017 National NAIDOC Lifetime Achievement Award, Di Ryder; Member of the Order of Australia for her significant service to the Indigenous community of WA and 2016 recipient of the Aboriginal Award at the Western Australian of the Year awards, Rishelle Hume; and Dr Cheryl Kickett-Tucker, whose list of achievements and credentials could fill a billboard herself, Founder and Executive Director of Pindi Pindi Pty Ltd, Centre for Research Excellence in Aboriginal Wellbeing, Professor, Indigenous Research Leadership, Centre for Aboriginal Studies at Curtin University and Honorary Research Fellow at the Telethon Kids Institute to name a few. 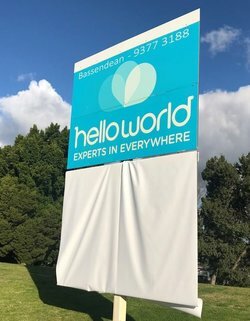 Continuing the thread of exciting announcements, The Swan Districts Football Club is pleased to reveal the winner of the billboard design competition. Congratulations Stacey Blurton from St Michael’s Primary School! Judge, Kylie Graham, considered both the skilfulness of the artwork and the clarity of message conveyed in the design to determine the winner. Graham said she was amazed and impressed by the calibre of the work presented and choosing the winner was a difficult task that took her a long time to decide. Stacey’s winning design will be sign-written on a billboard and unveiled at Swan Districts’ NAIDOC home game against Perth Football Club at Steel Blue Oval tomorrow where it will remain on display for the remainder of the WAFL season. 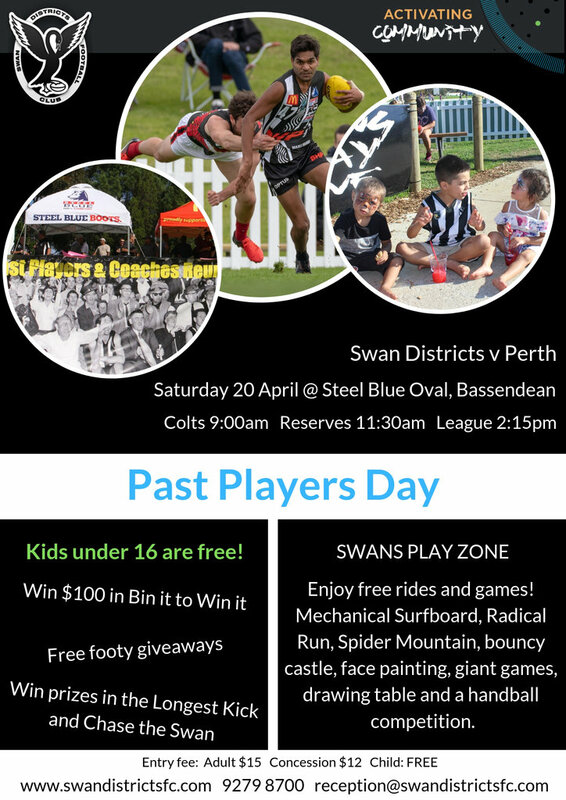 In addition to the billboard reveal, the Swan’s NAIDOC Round home game will also feature a Welcome to Country, Aboriginal Basket Weaving and the Marngrook Exhibition Game as well as crowd favourites – the Bin it to Win it competition and the Swans Play Zone, which hosts a huge range of free games and activities including bouncy castles, giant games, face painting, laser tag and more for child match attendees to enjoy.